Published 1982, by Title Atlas Company, Minneapolis, MN. Cover and inside pages are nice and clean. Has been little used. Numerous township maps show the location of thousands of farms in Otter Tail County. 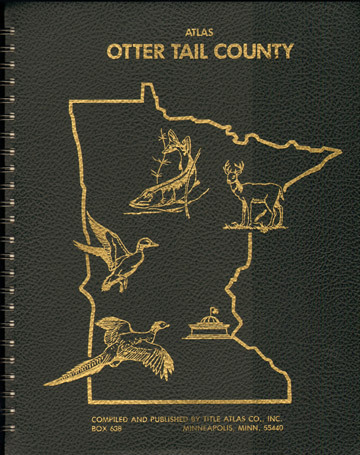 Also included is a directory section with thousands of short family listings that give the name of the farm owner, farm location, phone number, name of father, name of wife and of children, church affiliation, military service, employment, length of residence in Otter Tail County, and mailing address. Oversize pages measure 10 x 13". Original price from the publisher was $64.50, in 1982. Vinyl cover with steel coil binding, about 260 pages with index. The book described above is priced at $22.95 plus $1.95 shipping. If you wish to pay by credit card, please use the shopping cart below (checkout goes to a secure server.) Credit card orders may also be placed by phone to Hearthstone Legacy Publications from 9 AM to 11 PM (Central Time Zone) Monday thru Saturday at 816-204-7593.